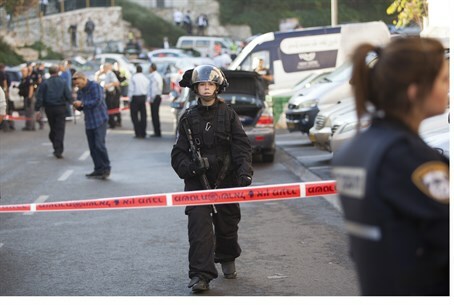 The eastern Jerusalem home of one of the Arabs who murdered five people at a synagogue was sealed. Security forces sealed the home of one of the terrorists who carried out the massacre at the Har Nof synagogue in Jerusalem on November 18. The action was carried out Wednesday morning at the home of one of the two terrorists, in eastern Jerusalem's Jabel Mukaber neighborhood. The four victims - Rabbi Moshe Twersky, Rabbi Kalman Levine, Aryeh Kupinsky, and Avraham Shmuel Goldberg, hy"d – left behind grieving widows and 24 orphans between them. Terrorists Ghassan and Uday Jamal stormed the synagogue armed with knives, a meat cleaver and a pistol, inflicting horrific wounds on their victims, which also included eight injured – four of them seriously. Druze police officer Sergeant Major Zidan Seif was killed by the terrorists when he tried to stop them as they left the scene of the crime. The terrorists were shot dead by police. It is not clear which of the two terrorists the home that was sealed belonged to, and why both terrorists' home were not sealed (there is also a possibility that both lived in the house, since they were reportedly cousins). Nor is it known if the sealing is a preliminary step before a demolition. Arutz Sheva inquired about this with the Israel Police but was told to ask the Jerusalem Municipality, or the IDF Home Front Command, which specializes in dealing with demolished homes. The Jerusalem Municipality said it had nothing to do with the demolition and the IDF Spokesman's Unit promised to return to us with details. According to 0404 news, the home sealed belonged to terrorist Uday Abu Jamal.